"I find it in the pigments..."
"Of your eyes as they glisten..."
"Confirms I'm real in that instant..."
"The moments I've lived like a relapse..."
"Didn't think I lived until we made contact..."
"Trail and error... the Scientific method..."
"You we're the catalyst, perfected..."
"And so you talked me out of my depression..."
"Every moment spent with you was simply..."
"What are we made of? I often wondered..."
"You know when we fall asleep to that eternal slumber?..." "Stop trying to solving this mystery, it doesn't really matter..."
"What's important is we share some laughter..."
"We are all just stars that have people names.﻿.."
"We have calcium in our bones..."
"And nitrogen in our brains..."
The Mahogany body vibrated, as the sound of the steel sings being strummed rang in the hallowed body of the guitar. A song began to form as the melody played danced with somber lyrics at a waltz like pace. A small crowd of people gathered around a lone willowy figure of a young man who was singing to the open space. The musicians eye's glistened as if reflecting a far off emerald green sea. The cold air softly nipped on the ears of those who listened, as the song tickled their souls. An open guitar case with collected snow and a single white rose in the center, invited those who enjoyed the tune to make a small dedication of coin to the young man playing. The singers breath escaped his lungs as it let out a steady stream of notes. A puff vaporous condensation puffed out of his lips as he softly exhaled every rhyme. His fingers locked in a intricate dance with the strings using the fret boards of the guitar as the dance floor. The tempo of the song slowed as if lulling the whole melody to sleep. Eventually the guitar ceased to play, leaving the voice of the musician left alone to carry the burden of conveying the lyrics. His voice softened to a whisper as the song drew to a close. Then there was a silence that took the stage for a brief moment. Suddenly the silence was booed away with the cheering of the small crowd. The Musician smiled as he slid the guitar to his side and gave a graceful bow. The crowd began to divide into pairs or to singles. A few had some of their coin find its way into the open guitar case, decorating the white snow with a faint glitter. The lone white flower did not look so lonely anymore as it was surrounded by the coins. Coins that were tossed by those who enjoyed the song enough to open their wallets. The Young man thanked everyone that went up to greet him, which by the way was was not that much. A young girl with her mother approached. The small five year old took the coin her mother gave her and placed it gently into the open guitar case. "Thank you for the nice song....W-what's your name mister?" The child asked as she looked up at the tall young man. The musician chuckled as he knelt down to meet the child eye level. His sea green eyes sparkled as a he gave the child a smile as bright and warm as the sun. "Thanks kid...My names Tamlin... you can call me Tam" Tam reached out and gave the girl a pat on the head, he reached in his pocket and fished out a small blue lacrima that had the song he had just sang embedded into it. "Thank you for the kind donation... here I want you to have this, just tap it three times like so... and ta-dah! The song will play." Tam demonstrated how the lacrima worked, the little girls eyes widened in awe. Her mother wanted to decline the kind offer saying that they didn't have the money for it. Tam insisted and gave it away without charging anymore. The child happily took it and went along her with her mother. He waved goodbye and when he thought he was by himself he scooped up what little coin he earned. Tam tossed the coins in a small pouch and to placed it in his bag. As he rummaged through his belongings Tam noticed another pouch. Tam let out a sigh and peered inside. The pouch glistened with small blue lacrimas, the same shape and make that he had just given to the little girl. There was about twenty of these lacrimas. "I could never break even with these...." chuckled Tam. He knew that it was foolish to spend the time and effort buying these lacrimas to record his songs if no one ever bought it. Often times he would just resort to just giving them away or erasing the songs inside and resorted to reselling them to a second hand shop. Regardless it didn't make him any profit, even so he found joy every time he could hand it out to those who really liked his songs. Besides... Tam wasn't after the fame or fortune, he just wanted to share his music and perhaps pick up a little coin along the way. Tam picked up the white rose gently brushing off and blowing off the snow that had accumulated on it's petals. He then lifted his guitar case and shook out the snow before placing his guitar inside. Tam closed the case and propped it on to the near by bench. He sat down and began humming to himself as he took out his worn note book that was stained with ink and coffee. The ratty pages we're scribbled with lyrics and doodles. Tam's green eyes scanned the pages as he took out a pen and bit on the cap to lazily uncap it. He placed the pen tip on the paper and began thinking as the pen cap protruded from his mouth like an unlit cigarette. "What to write...What to write..."
This was a new place. Talonia. The queen has yet to come here before… but so far, the girl was simply adoring the various places that were around. Not so much the laws though. She takes a deep breath as she walked past the bar, not finding much interest in alcohol, not yet. She swore she’d try some when she married, on her wedding night. She wondered if her prince charming was here now. What a lovely thing to find out while traveling, coming across her charming right in plain sight. She pushes her hair behind her ear as she continues to walk on, passing by a marketplace with others calling out to various patrons walking the street to come and buy their wares. As she walked, she heard talk of the arena, and told herself she’d have to stop by there soon. Eventually, she had made her way over to a park and was walking around aimlessly, enjoying the view she had of the trees and flowers in the planters and in some areas for others to roam in. She then hears some music playing and had to go and investigate what it was that she was hearing. It wasn’t long before she spotted a crowd of people and she decided to join it. Wiggling her way in the crowd a bit, a white haired, pink eyed girl, wearing a satin white dress, matching white gloves that ran to her elbows, and a crown upon her head, was listening to the music that the man played for them all. Only one other male had she heard play an instrument. She didn’t know who was better as it’s been a bit since she heard the original guy play. She’d have to have him play for her again. He had been cute too, but he was also already married, so she couldn’t have him even if she wanted him. She smiles to herself as she sways to the music, giggling quietly to herself. She was surprised no one was really paying attention to her, as she had a bright purple swirled asterisk in the middle of her chest, right above her cleavage. The girl also wasn’t wearing a jacket or anything, so the most she got was a quick glance at her baring out the cold like it was nothing. She peered through the crowd of people, and raised an eyebrow at the man’s eyes, smirking slightly as she quite enjoyed the look of his face as he sung and strummed to the crowd. She gingerly claps her hands together as the song ends, and everyone else claps. She starts to walk forward a bit, but a little girl had stepped in front of her with her mother, making the girl make a slight face, but she heard the girls question. She’d spare her this time. A smirk was on her face as she heard his name. Tamlin. Would this be her prince charming at last? A blush formed on her cheeks at that thought. A group of people had passed by her by then, making it seem like she wasn’t going to approach him. The rose made her look down to her finger. She had a white rose on her finger in the form of a ring. It was a beautiful thing she had. Now she kind of wanted that other white rose… or maybe the jewels he possessed now. A grin formed on her face once again. As she approached, she hears him speaking to himself, questioning what to write. For a moment she herself didn’t know, but the lightbulb went off a second later. She slips next to the guy and has herself just a tad too close since she wasn’t too familiar with personal space. “Why don’t you write about a princess who goes around a country to liberate the people of an awful ruler and frees them, eventually ascending the throne and becoming queen? All with the help of just a few people as her swords and shields.” Sh giggles quietly as she glances up to the guys face, raising an eyebrow to see what he thought of her idea for him to write. She then backs up a little bit. “You told that little girl your name was… Tamlin, right? I’m Saraphina.” She bats her bright eyes rather wide, grinning adorably to him while she waited for his response. She had raised her hand and delicately placed it on her chest, letting her fingers near cage her guild mark, but letting it still be visible. “Could you perhaps play another song for me, please? Pretty please? I liked that song you just played for everyone, a lot! And I’d simply love to hear you play more!” She muses to him while delicately nibbling on her bottom lip and slightly swaying from side to side. Lost in thought for only a brief moment a voice rang in Tam’s ear. He looked up from his notebook to find himself quite close to a very pretty young lady. It surprised Tam causing him to jolt, his mouth wide agape causing the pen cap to stumble on to his lap. The tips of his ears grew a very slight shade of pink. His emerald green eyes took in the appearance of the curious girl in front of him. Tam couldn’t but help but stare, wasn't she cold in this weather? As he got a closer look at her it was as if winter itself had a child, a princess of the ice... or even perhaps the queen of the winter wonderland. Tam chuckled and collected himself, the pink of his ears fading back to it’s original color. He gave her a gentle warm smile just like the warm sun on a beach. "Yeah that's my name... but please Just call me Tam haha..."
"Saraphina right?...I like your name.... it's pretty... a-anyway...uh...lets see." Tam rubbed his hands together warming them up. He then placed his hands on the fret board and began strumming random chords, trying to see which could string together and make a catchy tune. A few off notes were played but eventually Tam found a set of chords that played along nicely. "One...And a Two...and a Three..." On the third count Tam began picking the strings, as soon as he began to play the blue crystal began to glow a faint blue light. "Once upon a time, there was a princess dressed in white"
"Conquering evil left and right, from dawn until night"
"Where did she get all this courage I certainly don't know"
"She inspires and and facilitates this thing called hope"
"Oh darling princess keep you're head up"
"Fight through don't give up, your subjects trust you too much"
"Don't you hear it? The throne it calls..."
"Chin up my princess lest your jeweled crown falls"
"Once upon a time there was a princes white as snow"
"she had loyal subjects who followed her where ever she goes"
"Sword and Shield they raised up to fight"
"Loyal till the end they stayed right by her side"
"So my darling princess keep you're head up"
"Together she and her loyal subjects over threw the tyrants"
"Unwavering she stands tall, unmoved, and certainly not frightened." "The people rejoiced for the people were freed"
"For they where all saved by the princess during their time of need "
"So my darling queen you've kept you're head up"
"You've won and now you're showered with your subjects love"
"I see that you've heard how the throne calls"
"Keep you chin up my queen, and never let your jeweled crown fall"
Tam sang, his voice telling a tale of a brave princess. The guitar played a soothing mellow jazzy song. The words just came to Tam naturally. Eventually the song drew to a close and the blue crystal dimmed it's light till it was no more. Tam closed the locket of the necklace. He looked at Saraphina through his glasses and gave her a familiar smile. "Uh...I hoped you liked it... 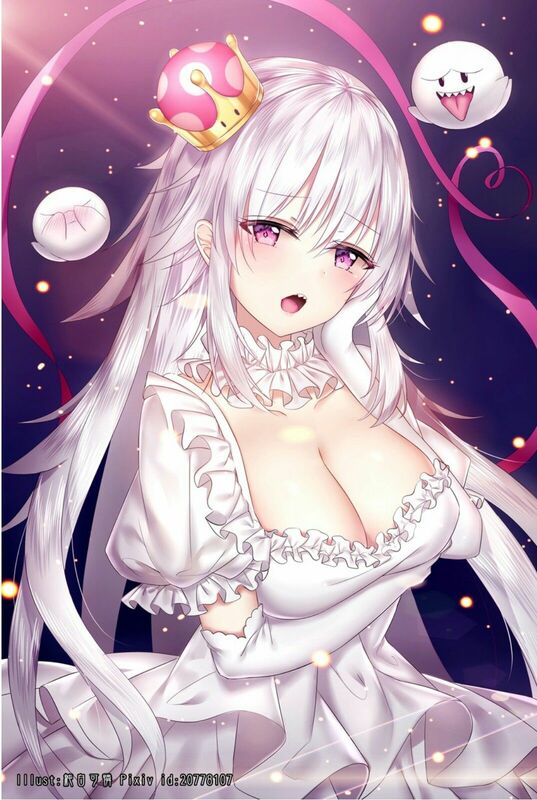 I guess I'll just call this song....uh Princess in White? Queen of Justice? Once Upon a Time?.... Uh I don't know....haha why don't you pick a name for the song?... after all you're the one who came up with the idea" Tam smiled as he set his guitar aside and sat down next to Saraphina. A giggle escaped the white haired girls lips as she heard him tell her to just call him ‘Tam’ after she had noticed his ears turning slightly pink. She watched him as he spoke about her topic. Yeah, it might of been specific, but she wanted to see if he could sing a song about her. Him calling her princess though… made a blush form on her cheeks. Sure, she had been called princess before, but for some reason it felt different this time around. He didn’t know her. Sure it could have been from her crown, but still. She gingerly took the rose, smiling to him sweetly as she sat there. This is what the world should be like. Giving her the things she wants, right when she wanted it. A grin was on her face as she giggles and smells the flower delicately. Quietly, she waited for him to start playing for her, wondering how he’d play the song. She watched the lacrima be attached to the locket. She let up a soft gasp as he played and the lacrima glowed while he begun. She held the flower near her chest while she swayed from side to side. She silently giggles at the use of words. Of course she conquers evil. She grins widely to him as the song came to an end, and claps her hands softly. “Oh! That sounded so beautiful!” She giggles and bites her bottom lip. She thinks for a moment, putting a finger to her cheek as she thinks of what to name the song. “Hmm… I think ‘Queen of Justice’ sounds lovely.” She decided as she nods to him. She would be lying if she didn’t think that’s what she was either. She looked over to the guy next to her with a sweet smile. “You play very beautifully. I wish I could just drag you around and let you play for me all the time~!” She sings softly to him. She personally loved her singing voice, but whether others did or not, she didn’t care. Her voice wasn’t too terrible to the average ear, but typically normal people wanted her to stop singing. She begun humming the song to herself quietly. “You must have a lot of fans with how great your music is!” She leans over to him slightly, giggling as she still held the rose in her hand. She was looking into his eyes for a moment, and nearly grins wide enough to show off her sharp teeth. She didn’t get too far though. She heard a gasp as she looks over to someone who had spotted her guild mark and seemed to recognize it. Sure… her guild would be slightly known by now. Right? It was classed as a dark guild, which she was slightly upset about, but not really. Bertrand only had done as he had been told, so he was okay. It was apparently her goal that classed her sweet and beautiful guild as dark. She didn’t care though. She liked how grand it was. She shakes her head a little as she holds the rose up once more and giggles to herself. “What brought you here? To this park?” She couldn’t help but question him softly.